This New York Times article describes recent research suggesting that – since we are hardwired to search for patterns that confirm our expectations – we work extra hard to find meaning when we are confronted with nonsense. The search for meaning in ambiguous or unexpected sitations motivates new thinking, new observations, new pattern recognition. This idea ties into some of the things Daniel Gilbert discussed in Stumbling On Happiness, which I reviewed here. The article mentions that we may also generate false or unreasonable conclusions (instead of just saying “huh, weird”) since we want to see patterns and confirm expectations. I tried to read the original research, but kept getting cookie errors with both Safari and Firefox. 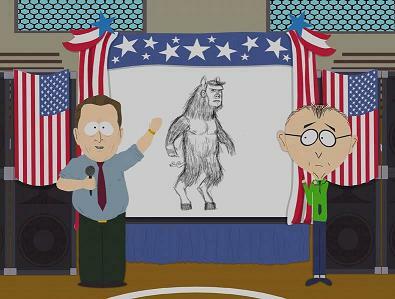 Does ManBearPig make you ready to learn new things? I knew it would. This entry was posted in Uncategorized and tagged books, Memory. Bookmark the permalink.